News > Brightwell Dispensers Inc ready for Chicago! Brightwell Dispensers Inc ready for Chicago! 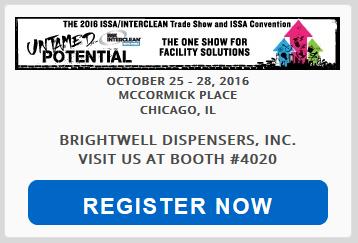 Brightwell Dispensers Inc, our American sister company, will be exhibiting at ISSA/Interclean Chicago, October 26-28. Visit us on booth 4020! Andy Lewis, Executive VP of Brightwell Inc, Barry Gothard and Richard Case, Business Development Managers of Brightwell Inc, will be on the booth together with Brightwell’s CEO Stephen Woolmer and General Manager Matthew Dwelly. Book an appointment now to meet the Brightwell team over the course of the show, or visit the us on booth 4020!